Mexico’s Craft beer producers will hold the first “RisingHop 2015” microbrew festival in Puerto Vallarta, at Parota Park on November 20 and 21, from 11 AM – 11 PM. The aim is to promote the culture of craft beer that has been growing in the country, responsible consumption and family life, said Jose Armando Alvarado, organizer of the festival. ‘It’s a good opportunity for people from neighboring states like Guanajuato, Michoacán, San Luis Potosi, Aguascalientes, Zacatecas, Colima and Jalisco itself, to visit Puerto Vallarta and enjoy Mexico’s growing beer craft,” said Alvarado. He noted that in Puerto Vallarta there are a variety of attractions, as it is renowned not only for its beaches and its wide variety of culinary styles, but also for the warmth and friendliness of the people in Vallarta. The first festival will feature 5 pavilions that offer, in addition to beer and food tasting, art, entertainment and activities for visitors of all ages. In total there will be more than 10 craft beer stands offering local, national, and international brews, and 10 food vendors offering traditional regional cuisine and international foods. RisingHop 2015 festival in Puerto Vallarta will include live music from local and national bands from electronic, jazz, blues, and rock. The pavilions will also host a variety of crafts from the region, such as handicrafts, jams, organic honey, bags, dresses, jewelry, bread, and more. For this festival, the participation of breweries Brewing Los Muertos in Puerto Vallarta, The Terrible, Brewery Colima, five brands from Michoacán Brewers Association, plus imported Belgian beer through The Beer Box. Friends of Puerto Vallarta Pet Animals and Purr Project, which will be present in publicizing their work and raising awareness to people about caring for their pets. A portion of the entrance fee will be donated to the two associations. 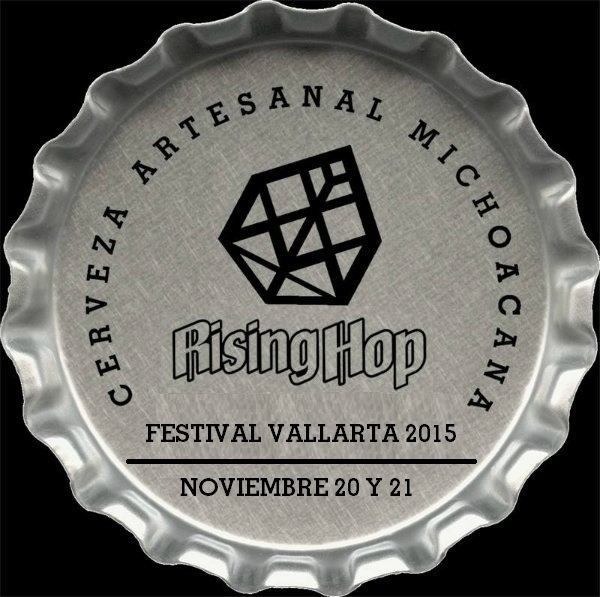 The entry fee to RisingHop 2015 is 100 pesos and will include a full pint or two tastings and bracelet. For people who come with family, there will be a nursery and playroom that will give small workshops, which will help kids develop their motor and mental skills by experienced psychologists. SEATTLE, July 8, 2014 /PRNewswire/ — Customers can now book travel on Alaska Airlines new nonstop flights from Portland, Ore., to Los Cabos and Puerto Vallarta, Mexico. Pending approval by the Mexico Direccion General de Aeronautica Civil (DGAC), the airline plans to begin seasonal service between Portland and Los Cabos from Nov. 3 through April 27, 2015, and between Portland and Puerto Vallarta from Nov. 4 through April 26, 2015. Alaska is offering introductory fares of $176 one way from Portland to Los Cabos, and $186 one way from Portland to Puerto Vallarta, on tickets purchased by July 14, for travel from the service start date through Feb 10, 2015*. “We’re happy to expand our longtime flying to Mexico with new flights to these two popular leisure resorts for our Portland travelers, who can take advantage of our award-winning service and low fares for their travel adventures,” said Joe Sprague, Alaska Airlines’ senior vice president of communications and external relations. **Between March 8 and April 4, flights arrive and depart one hour earlier due to daylight saving time. All times are based on local time zones. Alaska Airlines began flying to Mexico a quarter century ago and operates 240 flights a week during the winter between the West Coast and Mexico—more than any other carrier. Alaska flies an average of 1.5 million passengers a year to six Mexico beach destinations—Ixtapa/Zihuatanejo, Loreto, Los Cabos, Manzanillo, Mazatlan and Puerto Vallarta—in addition to Guadalajara and Mexico City. Alaska also will begin flights between Seattle and Cancun on Nov. 6. The new flights between Portland and Mexico will be operated with Boeing 737 aircraft. To book, visit www.alaskaair.com or call 1-800-ALASKAAIR (800-252-7522 or Hearing & Speech Impaired (TTY): Dial 711 for Relay Services). Alaska Airlines, a subsidiary of Alaska Air Group (NYSE: ALK), together with its partner regional airlines, serves nearly 100 cities through an expansive network in Alaska, the Lower 48, Hawaii, Canada and Mexico. Alaska Airlines has ranked “Highest in Customer Satisfaction Among Traditional Network Carriers” in the J.D. Power North America Airline Satisfaction StudySM for seven consecutive years from 2008 to 2014. Alaska Airlines’ Mileage Plan also ranked highest in the 2014 Airline Loyalty/Rewards Program Satisfaction Report. For reservations, visit www.alaskaair.com. For more news and information, visit the Alaska Airlines Newsroom at www.alaskaair.com/newsroom. *General terms and conditions for the introductory fares: Fares include all taxes and fees. Seats are limited and may not be available on all flights or all days. A ticket purchased at an Alaska Airlines airport location or through a reservation call center will cost $15 more per person than the advertised fare. Tickets are nonrefundable. Applicable fare and tax differences apply to any changes made after ticketing. A $125 (USD) change fee per person applies to any changes made within 60-days of ticketed travel. All fares, taxes and fees shown are based on one-way travel. Additional U.S. taxes may apply to itineraries involving a U.S. stopover lasting more than 12 hours. Bag fees apply for checked baggage. See checked baggage policy at www.alaskaair.com for more details. Fares are subject to change without notice. Other restrictions — blackout dates, day of week restrictions, schedule availability, change fees and advance purchase requirements — may apply. Visit www.alaskaair.com or call Alaska Airlines’ Reservations at 1-800-252-7522 for complete fare rules and fees. Puerto Vallarta, MEXICO (March 27, 2012) – Excellence in travel writing comes in many forms and, in Mexico, recognition for these endeavors now comes in the form of the Nick Gallo Award, created by MexicoPremiere.com and co- sponsored by Mexico Boutique Hotels four years ago in honor of one of the country’s fondest admirers. Today, another Mexicophile and, coincidentally, a long time friend of Nick’s took home this prestigious award. Larry Dunmire, journalist and photographer, put together an extraordinary look at whale sharks in Cabo in his article “Gentle Giants of Baja” (Cabo Living Magazine), which was chosen from among dozens of Mexico articles as an excellent feat of storytelling that will surely bring this astonishing adventure to the top of visitors’ lists for years to come. 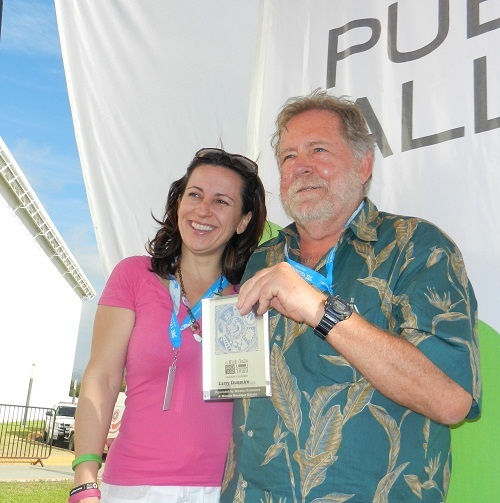 The 2012 Nick Gallo Award was handed out during a short ceremony hosted by the Puerto Vallarta Tourism Board during the Tianguis Convention, held for the first time in this exciting seaside city from March 25-28 in its new International Convention Center. This is Mexico tourism’s premier event, a gathering that brings together not only the industry’s buyers and providers, but also a brilliant roster of international and local travel journalists. David Simmonds and Lisa Coleman of Mexico Premiere and Sylvie Laitre of Mexico Boutique Hotels accepted the award on Larry’s behalf. Dunmire will receive this engraved plaque created by Nick’s widow, Laurie Brown-Gallo, plus a three-night stay for two at the incomparable Casa de Mita, thanks to co-sponsor Mexico Boutique Hotels. Casa de Mita is an ultra-chic beachfront pad, and an ode to good taste and effortless elegance. Owner Marc Lindskog has elevated all-inclusive to a new level, where service is as five-star as the meals, and the only place you’ll need your wallet is at the tiny—but irresistible—boutique shop. Congratulations, Larry! And, hey, Nick….We hope you’re having fun wherever you are. Nick Gallo, two-time winner of the Mexico Tourism Board’s prestigious Pluma de Plata award, regular contributor to such prestigious titles as Travel & Leisure, Alaska Airlines Magazine, United Airlines Hemispheres, Private Clubs, Northwest Airlines WorldTraveler, father, husband and matchless colleague, passed away in October 2007 while on assignment in Greece. 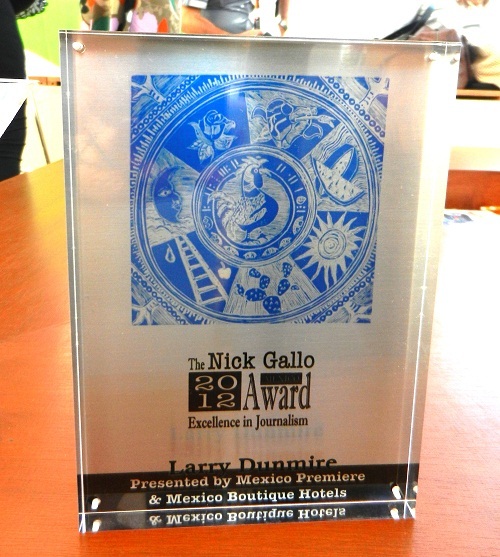 The following year we at Mexico Premiere started the Nick Gallo Award, dedicated to Nick’s memory and the lofty standards he brought, yes, demanded, to travel writing. The Gallo Award fills the void left when, at that same time, the yearly Pluma de Plata Award, presented every year at Tianguis by the Mexican government, was discontinued. A touching in memoriam written by fellow writers can be found at www.MexicoPremiere.com/?p=256. Puerto Vallarta, Mexico (January 6, 2012) — In honor of the 2012 US Presidential Election this fall, hotel guests can reap the benefits of candidates all year with presidential suite promotions at Casa Velas, an adults-only boutique hotel and ocean club in Puerto Vallarta, Mexico. Available now through December 22nd, groups of up to four people can take advantage of 50% off the Presidential Suite, while up to six traveling together will receive a complimentary Presidential Suite upgrade. At over 5,550 square feet, the four-bedroom Presidential Suite features original artwork by Mexican artist Sergio Bustamante, a spacious private terrace with a 376 sq. ft. plunge pool, expansive living and dining areas, full bar, formal dining table for 10, Italian marble bathrooms and more. All-inclusive features also include gourmet a la carte dining at the hotel’s Emiliano restaurant and Private Ocean Club as well as sister property, nearby Velas Vallarta’s La Ribera Steakhouse and Andrea restaurants; premium international liquors; mini bar in suite, replenished daily; and 24-hour in-suite room-service. 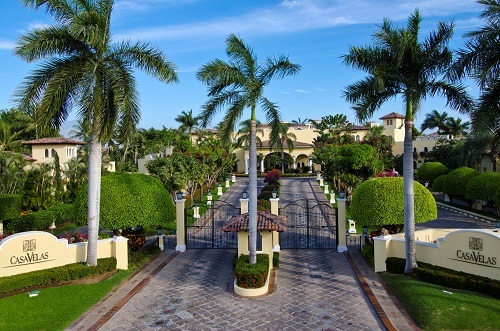 The use of all facilities at both Casa Velas and Velas Vallarta, in addition to shuttle service, and all taxes and gratuities are also included. The Presidential Suite Upgrade, available with reservations up to six people staying in a Grand Class Plus Suite or higher, starts at $320 per person, per night, based on double occupancy. Applying the 50% discount promotion, the Presidential Suite is $1,400USD per night with a maximum occupancy of 4 people. Additional persons are $260USD per night. 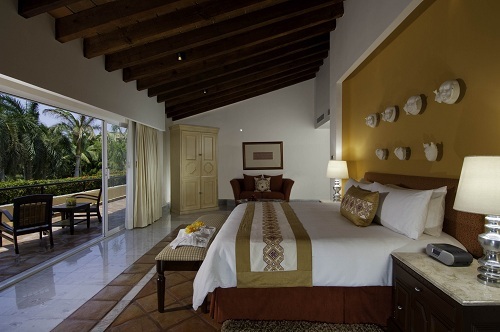 The Casa Velas Presidential Suite promotions are available now through December 22nd. The Presidential Suite sleeps a maximum of eight guests. Upgrades are based on availability. For more information or reservations, please call 1-888-296-9010 or visit www.hotelcasavelas.com. Casa Velas, a boutique hotel and ocean club nestled on the greens of Marina Vallarta’s 18-hole golf course, is a member of The Leading Small Hotels of the World and a recipient of the AAA Four Diamond Award. 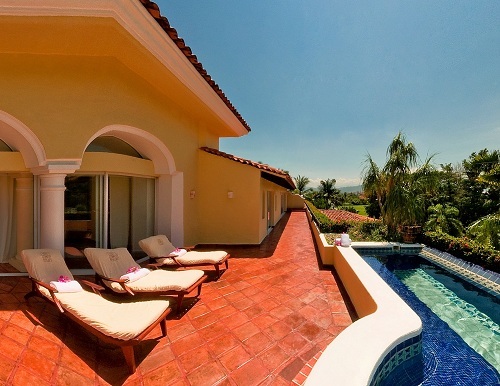 Located just five minutes from Puerto Vallarta Airport and only 15 from the popular downtown area, art galleries and “El Malecon” (the boardwalk), the hotel features 80 suites, some with private pools and Jacuzzis. The recently remodeled Spa Casa Velas, a Leading Spa of the World, encompasses five treatment rooms, a hydrotherapy area, a garden-view fitness center equipped with state-of-the-art exercise equipment, and a beauty salon. Emiliano a la carte fine dining restaurant is at the hands of one of the area’s leading chefs serving Mexican and international cuisine. Casa Velas was chosen a Top 10 in three categories – Luxury, Relaxation/Spa and Hotel for Romance – by TripAdvisor® in its 2011 Travelers’ Choice® awards, and Expedia® named Casa Velas among the top-ranked hotels on this year’s Expedia Insiders’ Select™ list which formally recognizes the best hotels worldwide that consistently deliver excellent service, a great overall experience and a notable value.